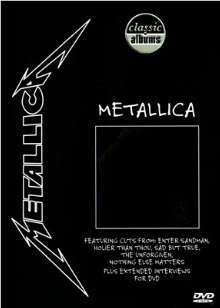 Classic Albums: Metallica – Metallica is a documentary about the making of the eponymous album by the American heavy metal band Metallica. It is part of Series 3 of the Classic Albums series. It was released on November 6, 2001 by Isis Productions/Eagle Rock Entertainment, months after bassist Jason Newsted left the band. The documentary covers the story behind the creation of the album, including interviews from members of the band, and their new producer Bob Rock, as well as archived footage of the recording process. Most of this archive footage was taken from the first part of the 1992 documentary "A Year and a Half in the Life of Metallica". The documentary features both original multi-tracks and demo recordings, along with the five singles from the album namely: "Enter Sandman", "Sad but True", "The Unforgiven", "Wherever I May Roam" and "Nothing Else Matters". This article is issued from Wikipedia - version of the 1/15/2015. The text is available under the Creative Commons Attribution/Share Alike but additional terms may apply for the media files.